A couple of weeks ago I ate some delicious asian style scrambled tofu at a cafe. In my pre-vegan days one of my favourite weekend breakfasts was scrambled eggs on toast. I have never tried to replace it with scrambled tofu, figuring that it would just be a disappointment. As a general rule I hate replica foods, at best I find them a disappointment, at worst disgusting. But this week I gave it a go. Almost every scrambled tofu recipe out there uses firm tofu. I can’t think why, the texture is just wrong. 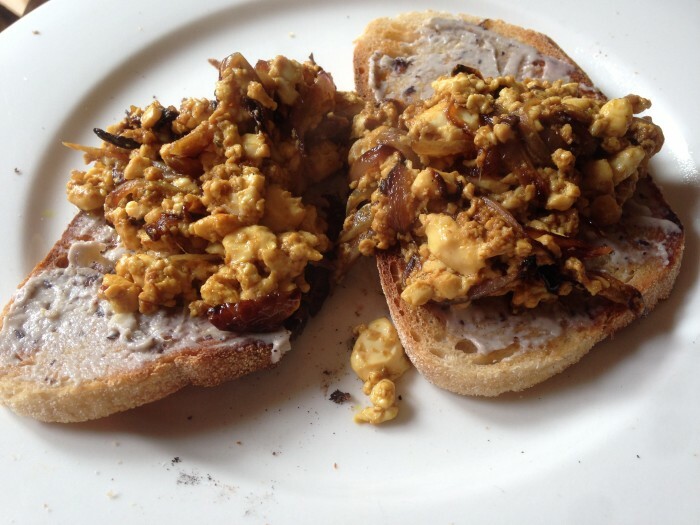 I used silken tofu because it most closely resembles the soft texture of good scrambled eggs. With some turmeric for colour, fried onion, liquid smoke and chilli for flavour, what I produced was not just a really credible replica of scrambled eggs, but a really, really delicious dish in its own right. It will become a regular Sunday breakfast. I served it on sourdough toast ‘buttered’ with some cashew cheese. Heat the oil in a frying pan and fry the onion until nicely brown. Don't shortcut here, the flavour relies on the onions being nicely caramelised. Add the turmeric and liquid smoke and continue to fry stirring occasionally. Once done stir in a few drizzles of sriracha chilli sauce. Add salt to taste. I don’t think I’ve tried liquid smoke in a tofu scramble! Have you ever used black salt in yours? If you miss the taste of eggs then it might appeal to you.